This sounds a bit like “Little Blog on the Prairie” (c2010) and PBS’s “Frontier House” rolled into one. Like you said, the author missed the mark for the 1861 year setting but the time period connection will still be there, I suppose. Thanks for posting! Yes, still outhouses and drawing water from the creek. I think the author chose that year because she included among the “town” a family who owned a couple of slaves. This did add to the story, but of course couldn’t have been done in a LIW year, as slavery was abolished by then. I never watched either of the shows you mentioned, but think you’re probably right. That’s good to know about the slavery aspect for 1861 North Carolina, which adds a dimension that LIW doesn’t address specifically in the LH books. “Little Blog on the Prairie” was a YA book by Cathleen Davitte Bell. A teen and her family go to a camp (in Wyoming?) that has everyone living the pioneer life but the teen sneaks in her iPhone to keep in touch (and complain!) about the pioneer camp life. The other PBS reality series “Frontier House” was filmed in Montana as 3 modern family units stepping back to homesteading circa 1870s, quite like this book you presented. I have a copy on VHS but I’m sure it’s on DVD by now. This also is a similar premise of a teen in the YA book “Laura Ingalls Is Ruining My Life” by Shelley Tougas (c2016-17). Poor LIW gets blamed for all the dysfunctional families in today’s society! It was funny to me that in the Upside Down, one character addresses the fact that LIW never lived in NC, but not that the year was off, too. Still, the story wasn’t really about LIW so I considered that a minor detail. I’ll have to check out the book/shows you mention. It seems people are waking up to the fact that, nostalgic as we may sometimes be for the “simple life,” it wasn’t really that simple. I credit LIW (and Rose) with making it seem so rosy. 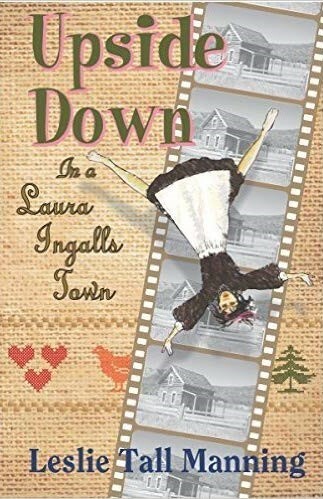 When I consider how Laura (and Rose) wrote the LH books, the time period setting, the time period of the writing, and the children’s audience they were written for, I understand completely why some of the hardships of living weren’t described. The descriptions of WORK and LIVING were featured and highlighted- not the personal/feminine hygiene which was NEVER written about in children’s books (the only scene that gets kids a-twitter is Almanzo’s bath in Farmer Boy!). However, in my children’s programs I feature the hard work of making everything from scratch or by hand – and kids marvel and “get it” when they “wash on Monday….churn on Thursday….” in the activities. I think this would make a good panel discussion for LP19 – maybe for educators and for writers of children’s historical fiction. I can understand why some things, like hygiene, were not mentioned. What strikes me is that with all the descriptions of WORK – and there was a lot of it – we (society) still think of the time as easy and simple. It wasn’t either of those.